Courtesy of Lamberts Espanola, S.L. and Lamberts Healthcare Ltd. 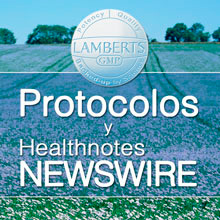 The section Healthnotes is only available in Spanish. Sorry for the inconvenience. Protocols are available in both languages. This information is available only for the Health Practitioners. You must register at no cost before accessing to these sections. We wish you success on your daily practice!